Dr. Black prefers to first evaluate children around age 7 to advise if orthodontic treatment is required and to determine the best time for that child to be treated. The first permanent molars and incisors have usually come in by that time and crossbites, crowding, and other problems can be evaluated. For very young children, Dr. Black recommends ortho treatment only if there are significant long-term benefits to your child from doing so. But the initial measurements are very helpful in every instance to monitor future changes in growth and development. Dr. Black takes into account your child's emotional readiness for early treatment. He may decide to monitor your child, at no charge, until a later date if he feels that this wouldn't compromise the result and would make the experience easier for your child. When early or "Interceptive" treatment is recommended, it is because Dr. Black can guide the growth of the jaw and guide incoming permanent teeth. In other words, early treatment can simplify later treatment. In some situations, Dr. Black may recommend two-phase treatment for your child. "Phase 1" helps develop the jaw size in order to accommodate all of the permanent teeth, and to help coordinate how the upper and lower jaws fit together. 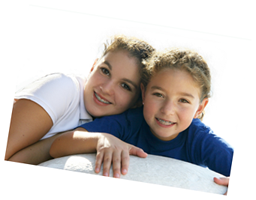 "Phase 2" is the stage where the alignment and straightening of the permanent teeth happens with braces. With two-phase treatment, the ideal timing of treatment is very individualized, based on your child's dental development and growth patterns.